What Ted, Abby and I got up to last summer is too difficult to put into words so I have documented it in the pictures below. This blog is at Ted’s request can I just add? Not mine. He’s adamant that if I give him some publicity in the world of sport then this time next year he’ll be presenting Sky Sports News. He assures me it has absolutely nothing to do with Charlotte Jackson, and if he’d not sky-plussed Splash every Saturday night then I might have believed him. Pretty sure it has nothing to do with Tom Daly. Unless there’s something you want to tell me Ted? As the summer went on, Ted spent more and more time in the outfield. I did warn him that there was a chance the Sky cameras would catch him and David Lloyd would be on his case, not to mention the Umpires! He remained unphased however and did some pretty pivotal fielding, especially for Glamorgan in the County Championship matches. He never quite made it to 12th Man on the team sheet but always got to have a drink with the players after each game… He did however got fined £2.50 during the T20 final for flashing at Phil Jacques, as you can see in the picture! Here is Ted much later on in the season. That little bear is getting cheekier and cheekier! He stole my red bra which he chose to wear out during a messy night at Tiger Tiger in Cardiff. 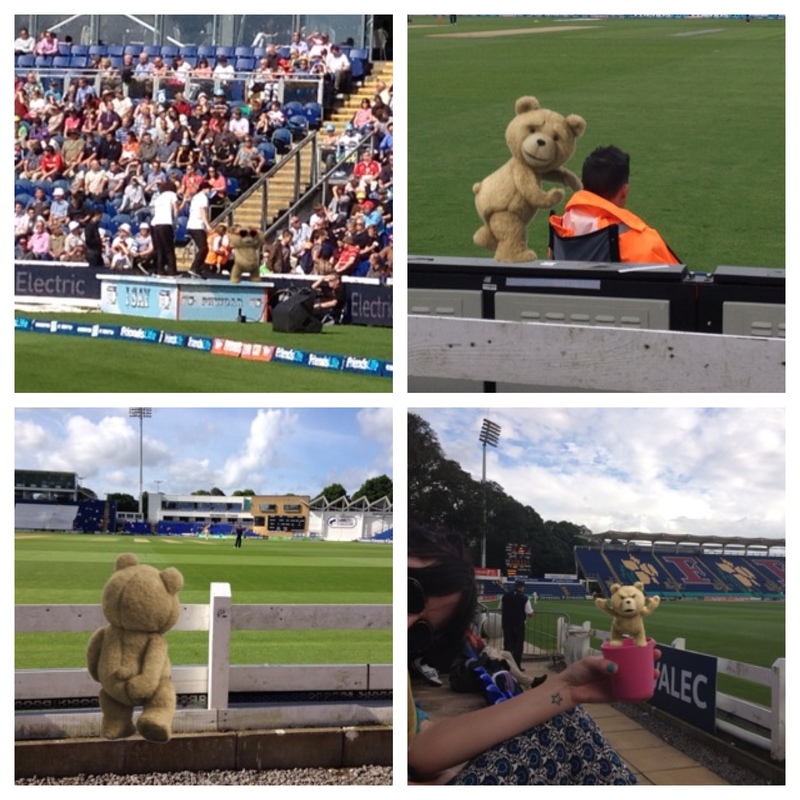 Classy Ted, classy! 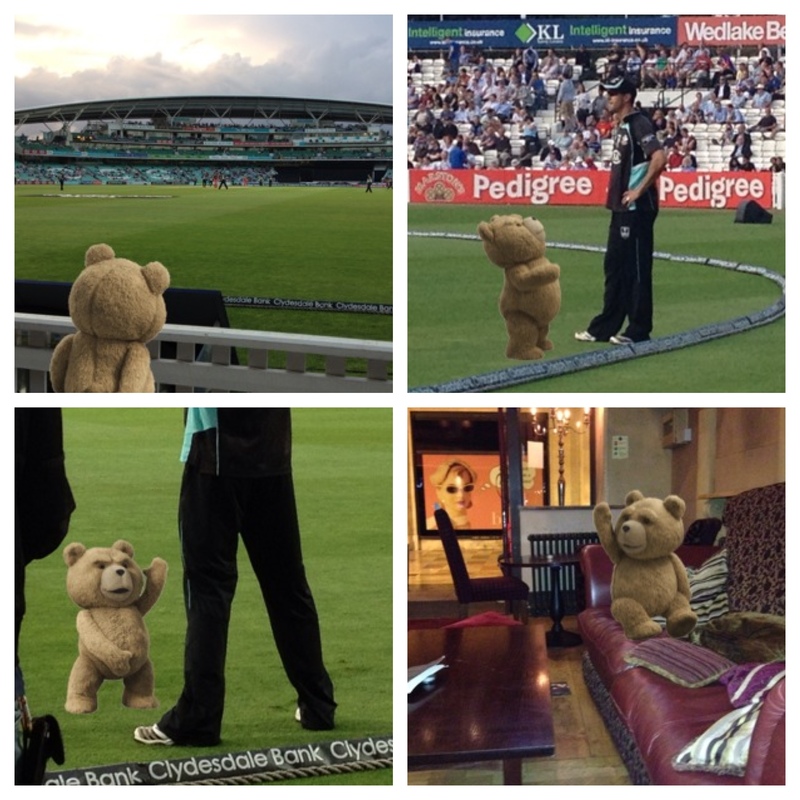 He was also cheeky at the matches too. 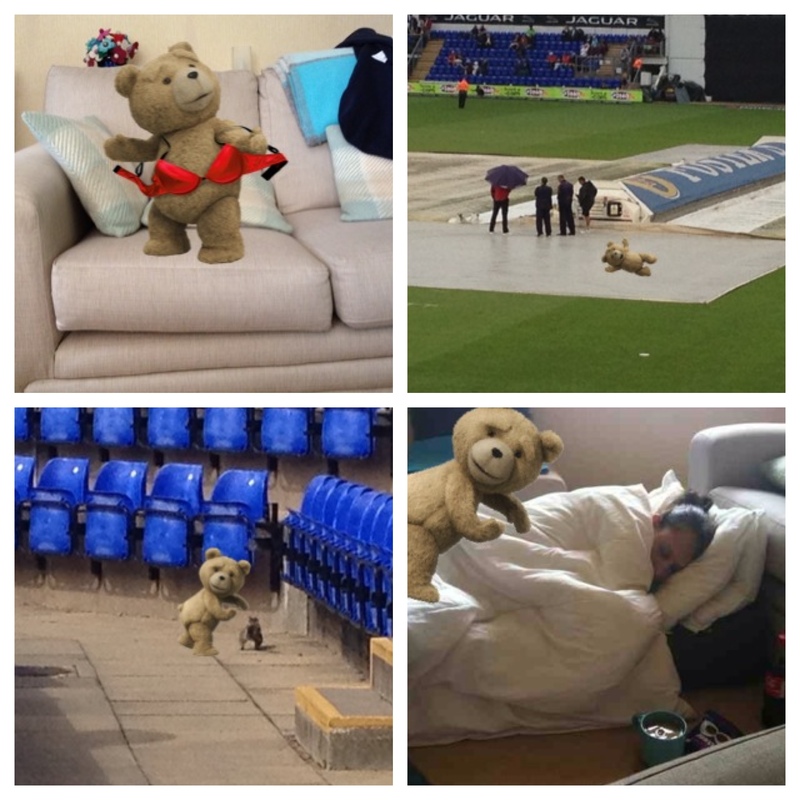 There’s a great picture of him here with the Glamorgan groundsmen during a rained off match. For that, he seem to aquire about 20 free pints from entertained elderly men in the Mochyn Du pub afterwards. I quite like the pic of Ted with the Glammy squirrel, Derek. 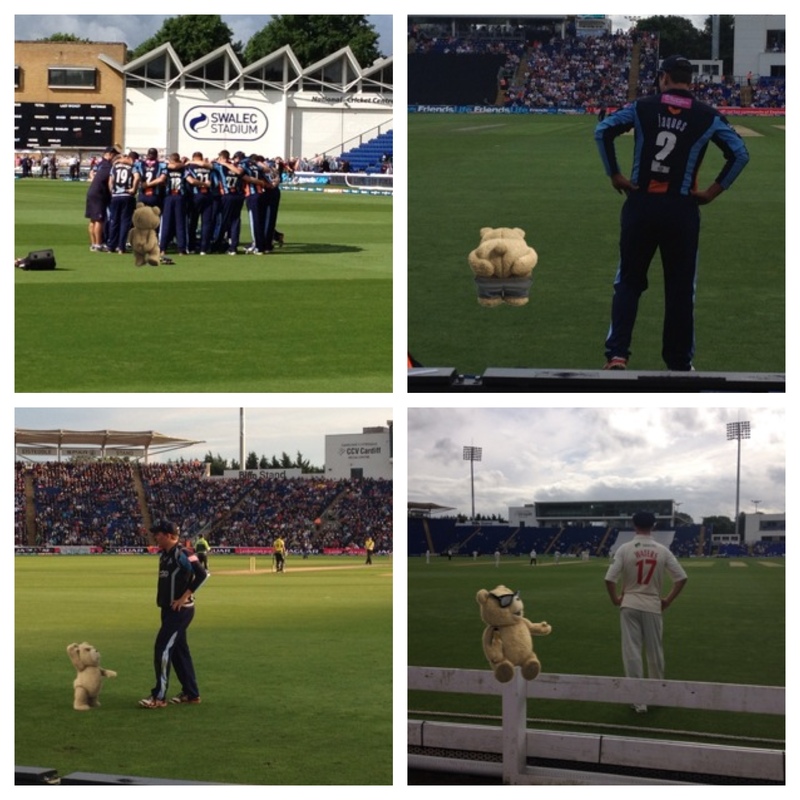 Hours of fun in the Jaguar stand when the run-rate slowed to 1 an over! Finally, I manage to capture one of him at the crease whilst the Umpire was on toilet break. He made a few dodgy decisions on account of him not being able to see over the wickets but he tried hard. He did have one stint with the great Ed Bevan of BBC Wales in the Commentary Box but his interview had to be edited due to his tourettes. 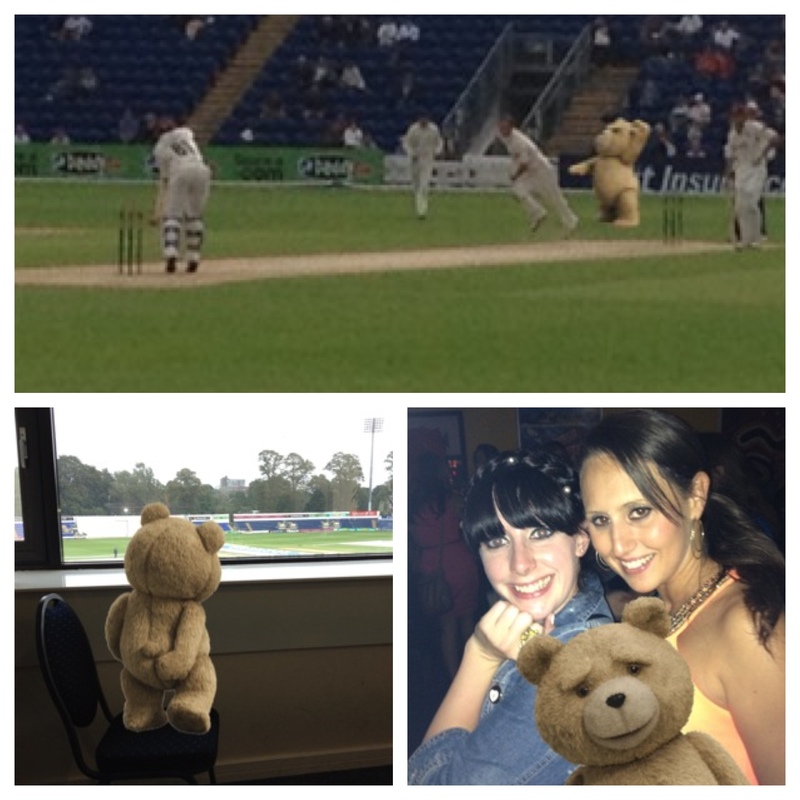 The bottom right picture is my favourite, it encapsulates the awesome summer @abbyosullivan and I had partying in the Welsh capital with Ted. He’s already started nagging me to take him to Australia for the Ashes at the end of the year. …Of course I will Ted. As soon as you stop swearing, getting hammered all the time and shouting obcenities at Phillip Schofield every time he comes on the TV. i knew that wasnt fox poo on the out field and around the area that is next to the hovver cover, and when i saw some one the floor in Tiger, Tiger, all becomes much clearer. You and Abbs should go to a doctors as soon as possible, i am not having another season cleaning up those little mistakes.